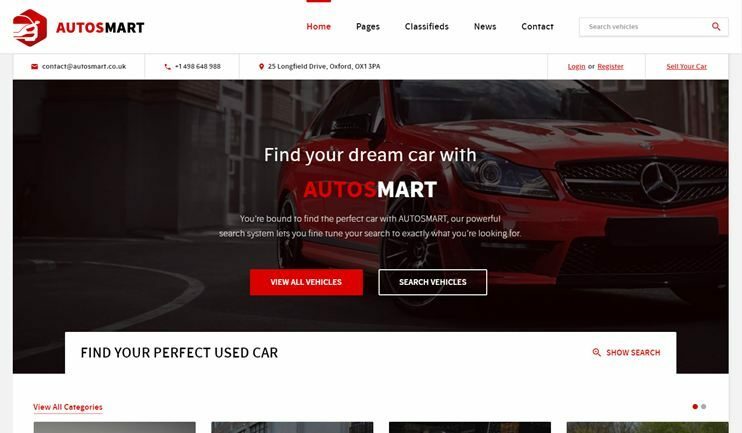 A car directory website is a portal where the buyers can find the car of their choice, as well as the sellers, can list the car to advertise it. As the owner of the website, you can earn commission through the dealership. Besides, there can be many advantages of owning a car dealership website. A car sales directory software can prove to be one of the most successful online ventures once it gains enough traction. 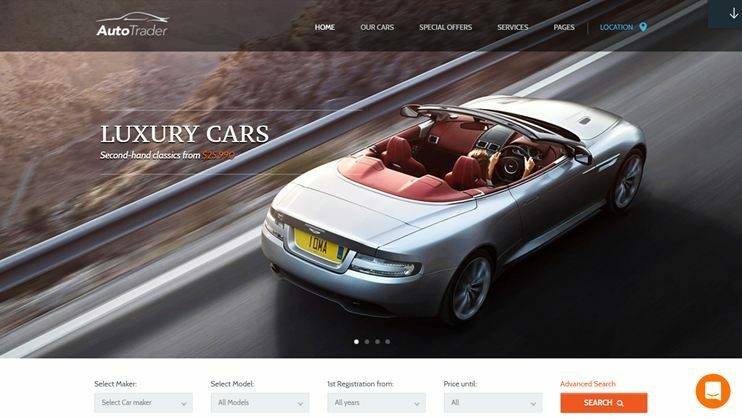 So here’s a list of the best automotive WordPress themes 2019 to create your automotive directory website. Don’t forget to check out this directory software to create an automotive directory or a car dealership website. A strategically designed automobile classified script to create an online car sales directory software. The automotive script for creating automotive directory website is designed so that the visitors can easily find the listings of their choice. Also, the theme comes with a ready to use customizable, submission form through which you can manage the fields of a car listing. Also, there are multiple ways through which you can make money through your automotive directory website. 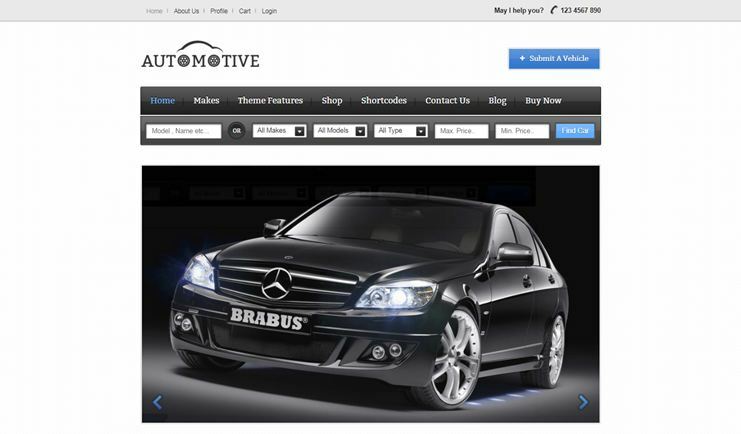 Automobile from Templatic WordPress theme allows you to easily create a car dealership website. Automobile is an SEO friendly WordPress template that can be used to create automobile directories. 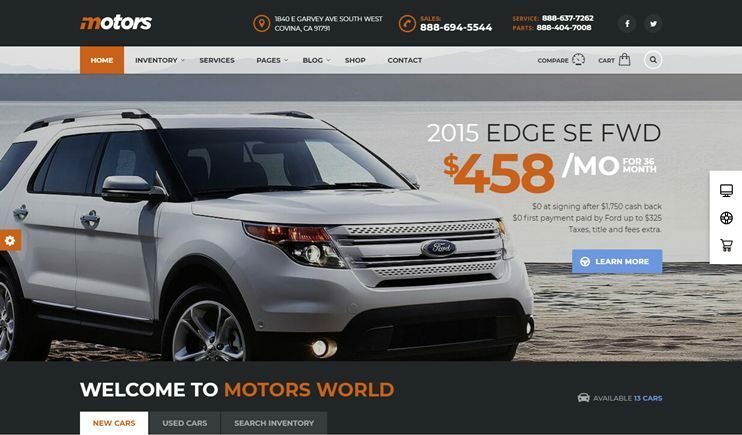 The theme comes with all the features needed by an automotive dealership website. 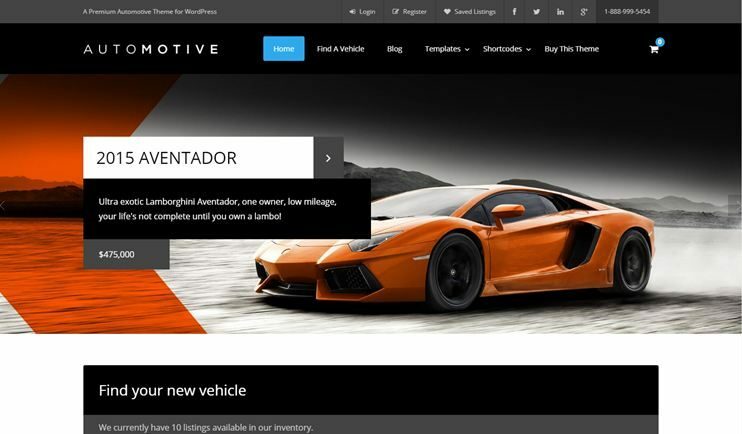 With this theme you can create an online car showroom to sell new as well as second hand vehicles. Each car on your website can be added as a separate listing. Moreover, the theme is elegantly responsive and highly customizable. CarSpot is feature rich, Modern Automotive Directory template built in WordPress. It has each feature needed to sell and advertise the classifieds of the car and other vehicles. It has advanced vehicle search functionality which can help searchings available models, Cars, and vehicles. It has 6 premade demos which you can select from. You can also customize the forms field using category-based custom fields, Messaging features, geolocation, bidding module and most familiar billing options and much more. AutosMart is powerful vehicle marketplace WordPress directory. It helps to build feature-rich auto classifieds website in minutes. It comes with four pre-styled homepages to get started with. It is compatible with the visual composer hence helps to create stunning homepages of your choice. It is also compatible with the WooCommerce and included the store in the theme which lets you set up your part store or dealership. The pre-made classified adds style gives you the functionality to change it as per your choice. 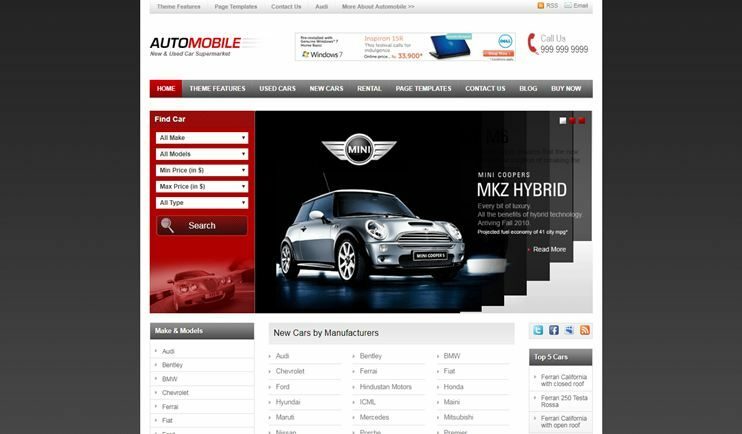 AutoZone is multipurpose, creative, modern WordPress theme, Created for specifically auto dealers. This is a WordPress theme that can be used for small auto dealership business as well as a huge car dealership fully functional portal. It includes inventory management system that is flexible so you can customize it as per your requirements and a loan calculator. It lets you submit the listing from the front end that Enables visitors to post vehicles from the front end. It also includes a dealer management console that supports multiple listings, Integration of Paypal, and much more. 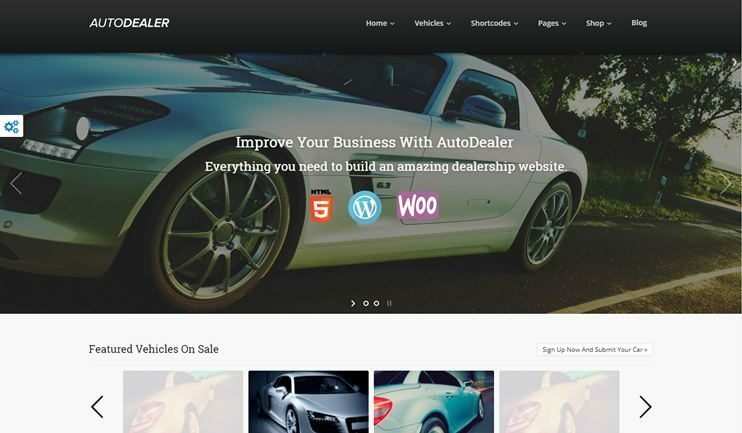 This is one of the best mobile friendly Car dealer automotive WordPress theme which is flexible. It is multipurpose and has a modern design that can be used for creating any kind of automation-related website. The theme comes with 10 different homepages. The theme has versatile features needed for the proper well-managed vehicle dealership website. The inbuilt google analytic tool helps to gather data and generate the report with sleek and streamlined dashboard you can track customer activity on your site. With the geo-fencing, you can target the area on which you want to market. Furthermore, The template gives the facility to generate the vehicle brochure. And you can import and export the inventory which reduces the time of manual entry. 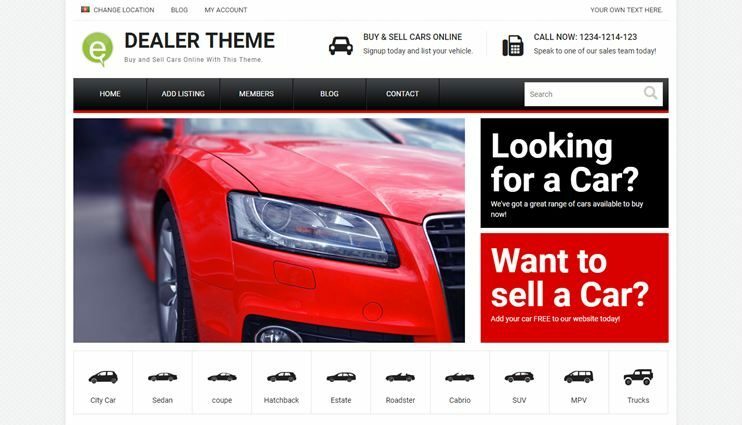 If you want to build up car or vehicle listing website with all excellency of marketplace site, check out this theme. The design of the theme is fully responsive and customizable. You can set your own set of the required field on front-end submission form. Moreover, it has the front end submission for users and dealers and a comparison feature. Moreover, there are features related to resent search to show the recently viewed the listing and saved listings. Beautifully designed WordPress theme with beautiful features. You can choose from the available demos and get started with your website in just minutes. The theme comes with drag and drop features to build any design with ease. Choose from the Grid and List layouts to display your website's inventory. Also, it has the comparison feature and a finance calculator. Also, the map integrated theme makes it easier to find the locations. It comes with PayPal integrated for easy transactions. The auto trader auto classifieds scripts that you can use to create an automotive marketplace. Auto Trader is highly customizable and comes with beautiful animation effects. Also, you can integrate mega menus, and decorate your website with elaborate background and sliders. The theme lets you create unlimited custom posts for different vehicles or spare parts. The visitors can sell their cars on your website easily with the available features. 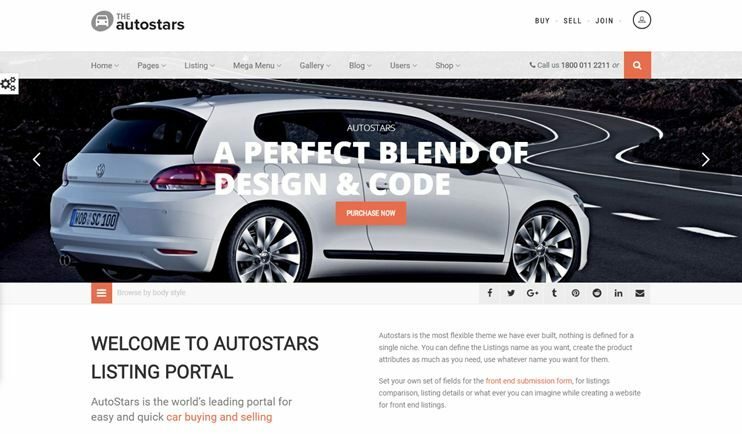 This auto script software is simple yet feature rich auto dealer php script for WordPress. The theme comes with a fully functional front end submission system for the users to submit their car listing. This theme provides you all the features to let you customize your website with the easy options available at the backend. The theme supports WooCommerce and therefore you can integrate all the eCommerce features into your website. Also, the search system of the theme ensures that the visitors find what they are looking for easily. 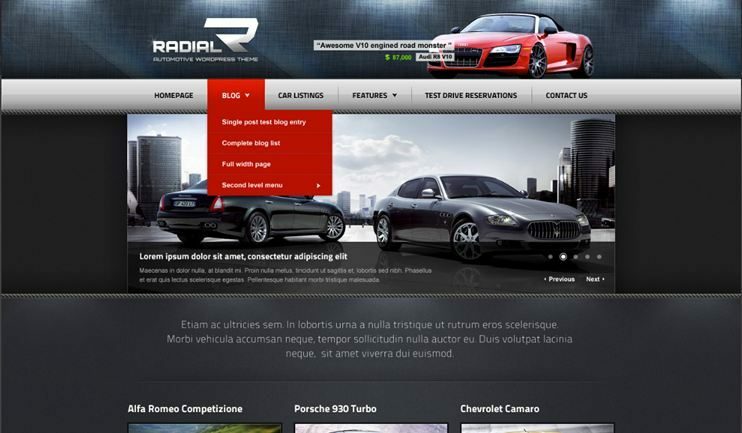 Radial is one of the auto directory WordPress theme that you can use to create a car dealership website. Along with that, it also contains the feature to allow test drive reservations for a car. Moreover, radial comes with a responsive photo gallery through which you can display your best cars. The theme has some color options, and customization features to let you manage the look of your website. 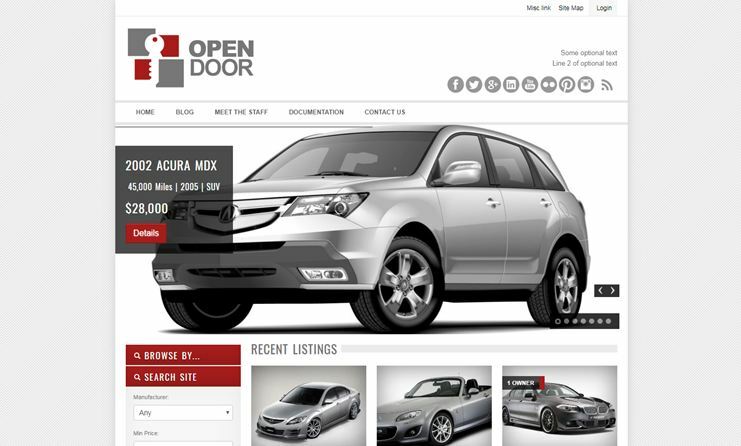 Open door is a dual purpose theme that you can use as an automobile classifieds software or a real estate directory template. The customizable theme comes with enough options to let you control how your website looks. The car dealership theme comes with the compare listings feature through which your visitors can directly compare two or three car listings at once. Also, it claims to have a very sophisticated search system to enhance the user experience. The autocar WordPress theme is one of the niche automotive directory themes for WordPress. Easy to customize, this theme comes with Google maps integration. You can choose from one of the four layouts for car listing detail page. The autocar WordPress theme supports Visual composer for drag and drop page building. Moreover, there are car search widgets that you can place in the sidebars of your website to make your website’s interface more user-friendly. 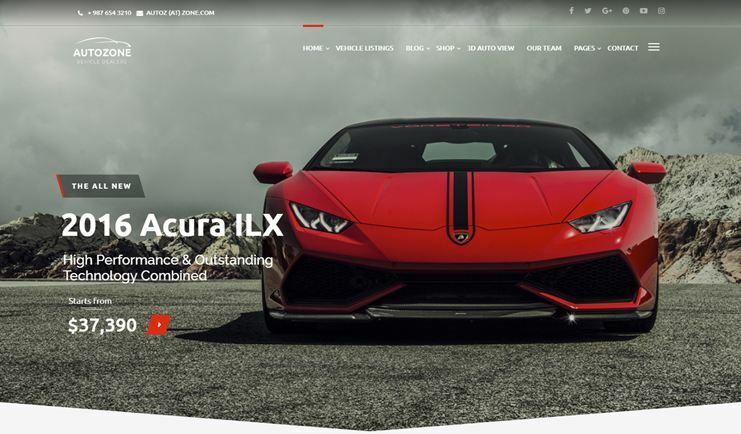 Auto Dealer is a performance and speed optimized car dealer WordPress theme that you can use to create an automotive marketplace. The theme has simple and straightforward structure and functions. Auto Dealer comes with Visual composer included. So creating pages and managing the appearance of your auto dealership website is a matter of drag and drop. The car dealer theme is ideal for car classifieds website or a car dealership website. This theme has a responsive design allows easy customizations. It supports front-end listing submission and memberships. The theme comes many other features like advanced search features for enhancing the user experience. 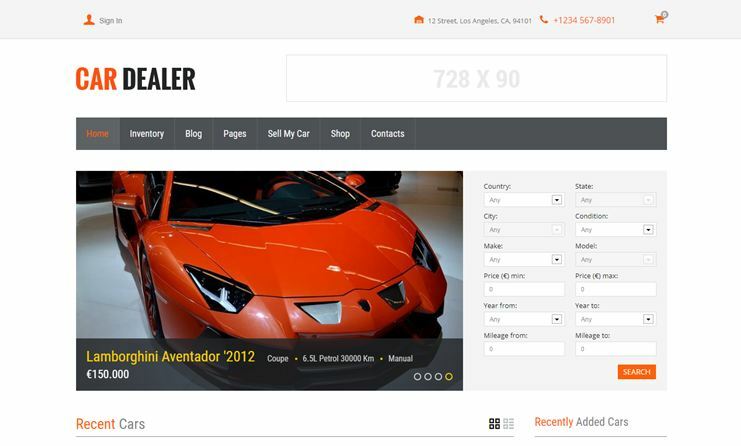 Also, Car dealer theme is search engine friendly and comes with PayPal integrated. 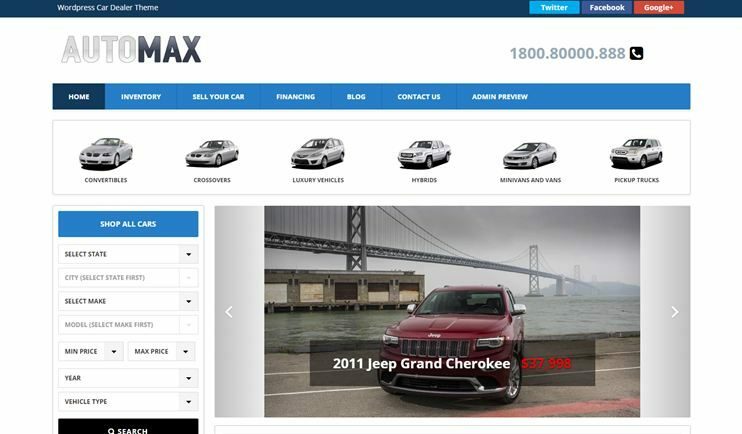 Automax is a WordPress car dealer theme that you can use to create an auto classifieds website. It comes with a ready to use car upload form through which the visitors can submit their car listings. Also, it comes with paypal integrated so that you can start accepting payment easily. Automax is fully customizable and you can choose the colors for all the elements of your website without touching a line of code. Wp Pro Automotive is an automobile classifieds software with a flexible front-end submission system. The theme can be used to create a simple car dealership website as well as an automotive directory website. It comes with a powerful page builder tool that lets you create the pages of your choice easily. WP Pro Automotive is SEO friendly and video ready if you want to display the promotional video of a car. 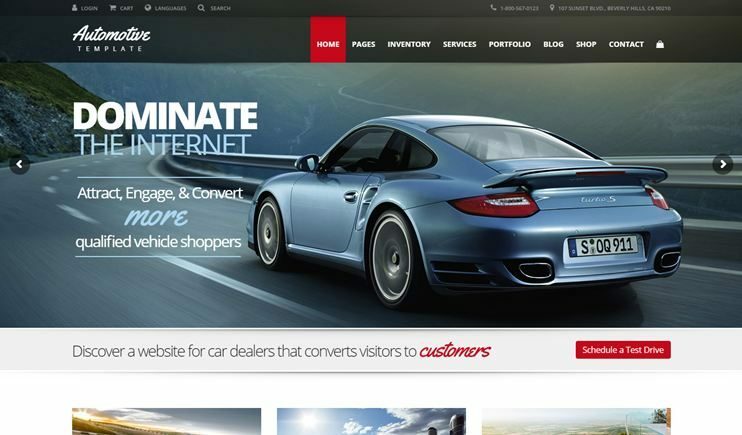 CarForyou is a car dealer WordPress theme. It lets you choose from the two homepage versions. 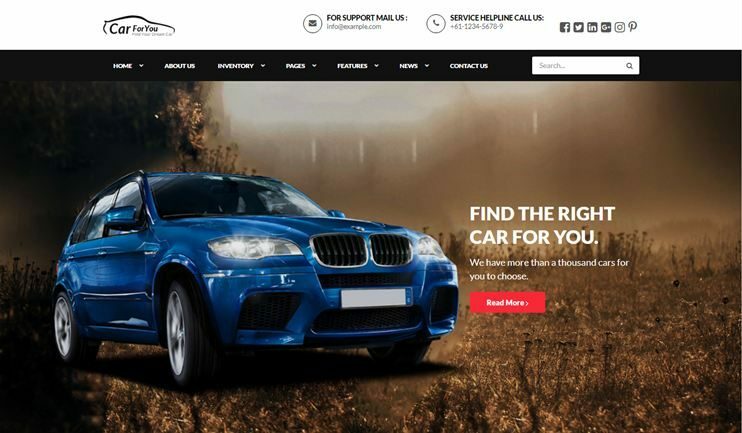 The car script website template comes with many other pre-designed page layouts. It also lets the visitors compare the listings on your website. Moreover, it supports Visual composer for drag and drop page builder. The theme is highly customizable and is SEO friendly. 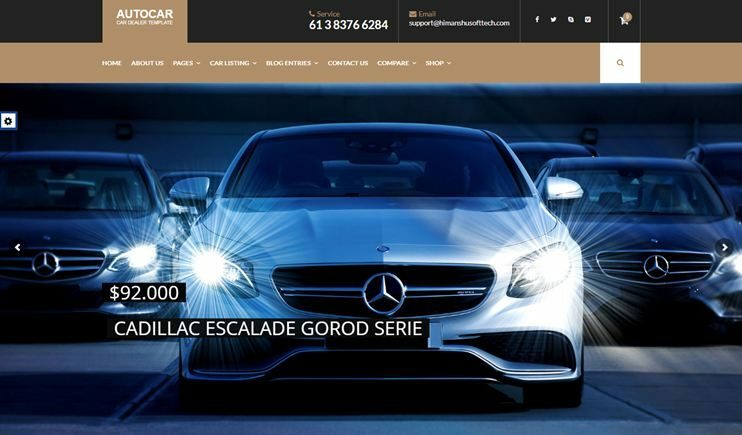 CarForYou is an RTL car dealership WordPress theme, it also supports WPML. So you can create your website in any language you want. 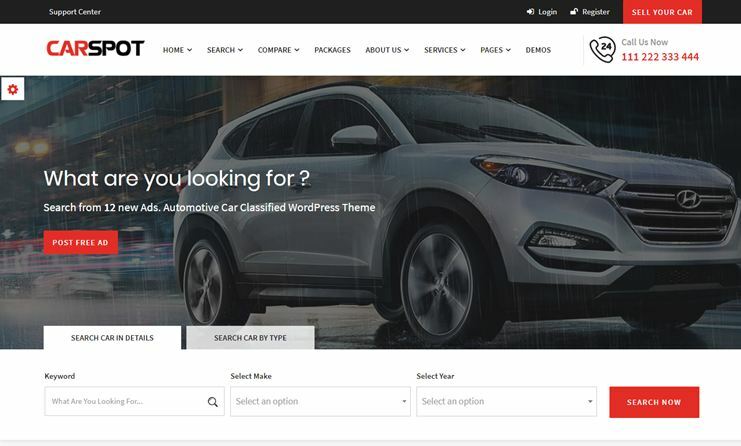 These were the best car dealer wordpress theme that you can use to create an automotive directory website. The themes are customizable and therefore you can shape your website as per your requirements. Online directories are becoming popular day by day and this is the best chance to get into the business. So are you ready to get started with your automobile directory now?